When it comes to running a restaurant, it turns out that it doesn’t matter how good of a chef you have in your kitchen, if your establishment is dirty. Without a clean table, a gourmet meal is considered filthy. In the restaurant industry, returning customers can make or break the success of a business. However, to get customers to return, your establishment must meet the standards customers expect. Even the entryway to your restaurant should be free of cigarette butts and trash if you wish to see repeat business. There can be many sources for dirt at a restaurant and staff needs to be prepared to address any facility flaws that may occur. 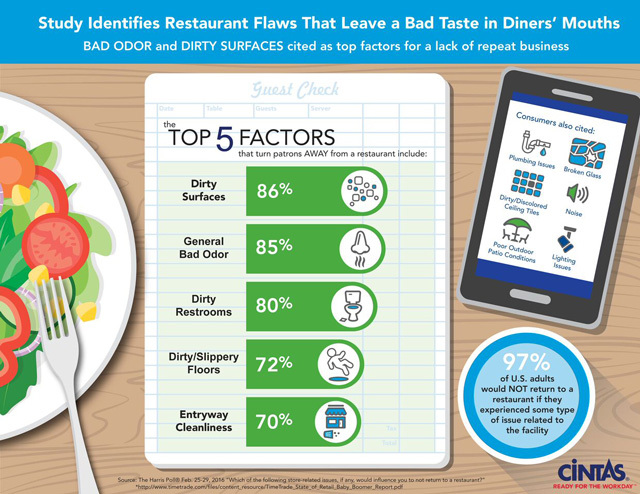 From plumbing issues to dirty or slippery floors, customers want to eat someplace that’s as clean, if not cleaner, than their own homes. They are trusting strangers to prepare their meals, and in a way, they are trusting that the same hygiene rules they abide by will be put into place out at restaurants as well. 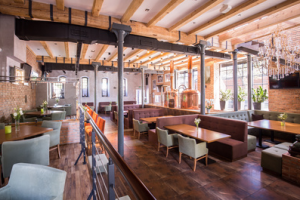 Something else to consider is how much of an impact word of mouth and social media will have on a restaurant. If something is dirty and unpleasant or a customer has a negative experience, there are a number of ways to share this experience with the world. Websites like Yelp or Open Table have the options for customers to rate restaurants on a scale from 1 to 5, as well as post photos and write comments about how their meal was. This can be the best or the worst thing for a restaurant. Everyone wants to go out to eat with the confidence that their food, table, and surroundings will be clean. This can provide a better experience overall for customers, and topped off with a great meal, owners will see returning visitors. With an entire line of food service products, Misco makes it easy to keep your restaurant shiny and clean, enticing customers to come back, and often. PreviousPrevious post:Leggo My Eggo, ListeriaNextNext post:Avoiding Puffy Cheeks or, How Can I Keep Healthy During a Mumps Outbreak?